Keeping rodents in check seems to have been quite a problem even for Nature, or she wouldn't have had to design such a high-tech killer as the owl. The technical specifications of owls read like something from the Mad Science Department at the Pentagon -- except that it works with unfailing efficiency, having been under development for about 26 million years. Rats and mice are nocturnal, but hiding in the dark won't save them from an owl. Owls have very large, deep and specially adapted eyes that can see in the dark -- and they see perfectly well in the daylight too, better than humans do. Most likely the rat won't even be trying to hide, because it won't know the owl is there. Owls have special feathers and special comb structures on their wings that muffle the sound of the air rushing by. They fly in an eerie silence, like ghosts -- the rat can't hear the owl, but the owl can hear the rat, and knows exactly where it is. Owls hear in three dimensions. The specialized part of the brain that deals with hearing is much bigger and more complex in owls than in other birds. The flat, heart-shaped disc of feathers that gives owls their distinct faces works like a radar dish, catching sounds and directing them to the ears. The owl alters the shape of the disk with special sets of muscles to focus the incoming sound-waves from a rodent making the slightest movement up to hundreds of feet away in the dark. The owl can gauge whether the sound reaches one ear before it reaches the other -- a time difference of only a few millionths of a second -- and turns in that direction until the sound reaches both ears at the same instant: the prey is then straight ahead, the owl moves in for the kill. 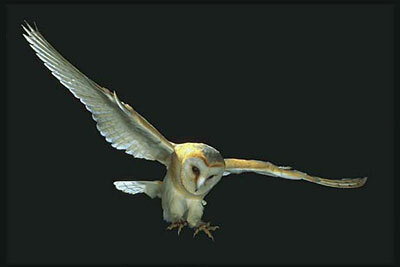 Barn owls and other night owls have one ear set higher than the other, and the ear openings are set at different angles: higher or lower sounds tell them how far away the rat is. The left, right, up and down signals create an exact image of the prey's location, even in total darkness. Barn owls aren't only nocturnal. Their excellent eyesight means they can hunt in the daytime too, and often do so with a clutch of hungry chicks to be fed. Owls have special wings, broad and rounded, with a large surface area. They fly without effort and can glide slowly for long periods of time, quartering the land up and down in search of their prey, then flying in fast for the kill. 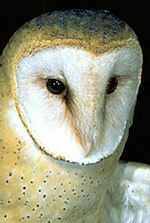 Owls, and barn owls, are found all round the world, and in a wide variety of habitats -- wherever there are rodents. It's mostly barn owls that farmers around the world are now using for rodent control. They're easily encouraged by installing nest-boxes and perches. Barn owls breed any time during the year, depending on the food supply. A pair may breed twice in a year, and barn owls have been known to nest all year round, raising as many as four clutches. They have a tremendous reproductive capacity and can breed rapidly in response to rodent plagues. They lay three to 11 eggs per clutch, fewer when prey is scarce and more when it's plentiful. The adults eat one rodent a night each, but the chicks will have at least two each, and up to five, depending on the size of the chicks and of the catch. A pair of barn owls with five chicks will eat at least 3,000 rodents in one breeding season. They're not territorial birds, and it's common to have many nest-boxes in action, with dozens or scores of owls working in one area -- a whole colony. In one study 48 nest-boxes accounted for at least 17,000 rodents in eight weeks. It's better to establish colonies of owls on a community basis rather than on one farm only. The birds hunt over a large area, often flying three or four miles in search of prey. A colony of barn owls will greatly reduce the local rodent population. But they won't wipe out the rodents -- that's not how nature works, she seeks balance, not destruction. The owls will control rodents, keeping their numbers in manageable proportions and preventing an area being overrun by sudden plagues of the pests. Effective trapping and preventive measures will do the rest. There are some problems with owls -- or rather not with the owls themselves but with the people. People are often frightened of owls, especially superstitious people. This applied to virtually all Europeans in the past, and some still feel that way today. The owl is an evil omen, a symbol of death and bad fortune. Its eerie, silent flight, its white face appearing suddenly from nowhere in the dark, and the terrifying screech it makes help to explain the worldwide superstitions about owls. 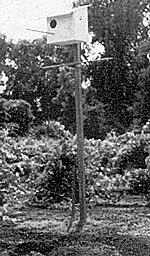 Workers on a rodent control project in East Africa setting up perches and nestboxes for owls were surprised by a highly negative reaction from the local communities -- to them owls were evil, the servants of witches, bringing bad luck and making the children ill. The problem was solved by involving the farmers in the program, with project staff explaining the aims and benefits of the work and giving information on owl biology and ecology. The rats were soon seen to be definitely worse than the owls. Now the nestboxes are up and have been very successful in attracting breeding owls. You'll find everything you need to know about using owls to control rats at the resources below.